The United States has imposed visa restrictions on Ghana following the government’s refusal to accept Ghanaian nationals deported from the US back into the country. “Ghana has failed to live up to its obligations under international law to accept the return of its nationals ordered removed from the United States,” Department of Homeland Security Secretary Kirstjen Nielsen said in the statement on Thursday.”The United States routinely cooperates with foreign governments in documenting and accepting US citizens when asked, as appropriate, as do the majority of countries in the world, but Ghana has failed to do so in this case.” Nielsen said the Secretary of State Mike Pompeo had instructed consular officers in Ghana to stop issuing some categories of visas to applicants. The DHS statement did not specify the categories of applicants affected by the sanctions. Without an appropriate response from the Ghanaian government, the visa restrictions could extend to a broader population.”We hope the Ghanaian government will work with us to reconcile these deficiencies quickly,” Nielsen said.CNN was not immediately able to reach the Ghanaian government for comment. 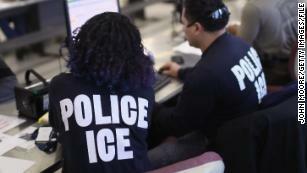 ICE arrests continue to rise in Trump’s second yearThree hundred and seven people from Ghana were slated for deportation from the United States in 2017; another 243 Ghanaian nationals were due to be repatriated last year, according to a report released by the US Immigration and Customs Enforcement. Countries with visa sanctions had higher deportation rates when compared to previous years, the report said.The United States imposed similar sanctions on Eritrea, Guinea, and Sierra Leone in 2017.